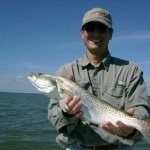 Today when we left my dock out of Everglades City we headed to a nearby grass flat to fish for trout and pompano . When we started our first drift across the grass flat the trout where on the bite we scored with 8 nice size trout and 2 nice pompano . Later on in the morning when the tide started to fall we decided to try our luck and catch a couple redfish so we stop a nearby creek that hard a oyster bar bottom and with minutes of casting out a smoke colored riptide jig we caught and released 3 nice redfish that where in the 8 lb range . Fishing in September has been great providing us with a lot of great action.